As stated in a previous post, heavily used transient BPEL processes should be configured with some well-defined parameters in order to avoid storing too much data in the database, thus optimizing performance. Off: No composite instance tracking and payload tracking information is collected. No more composite instances can be created. No logging is performed. Note that disabling logging and the display of instances in Oracle Enterprise Manager Fusion Middleware Control Console can result in a slight performance increase for processing instances. Instances are created, but are not displayed. Development: Enables both composite instance tracking and payload detail tracking. However, this setting may impact performance. This level is useful largely for testing and debugging purposes. 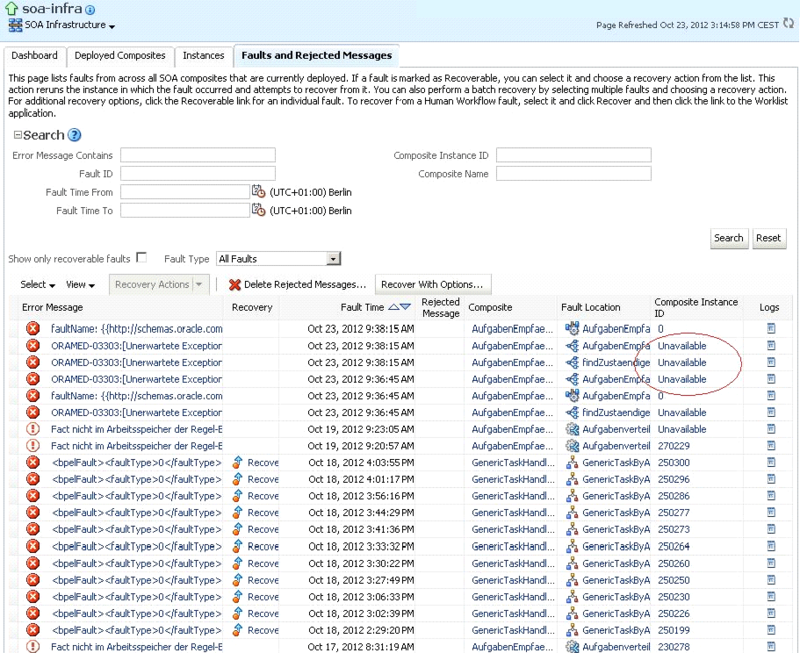 Production: Composite instance tracking is collected, but the Oracle Mediator service engine does not collect payload details and the BPEL process service engine does not collect payload details for assign activities (payload details for other BPEL activities are collected). This level is optimal for most normal production operations. Generally, the SOA Infrastructure audit level is set to Production or Development – depending on the environment – and the composites are set to inherit this audit level. In case of an intensively used composite this means that a lot of data is persisted in the database. How much information is persisted from the composite instance? How much information is persisted from the component instances inside the composite? What happens in case of an error? Our tests have shown that although the instances successfully complete, no information is stored in the database at all. Neither for the composite instance, nor for any business rule, BPEL or mediator instances inside it. In case of an unhandled error, however, the erroneous component instance is persisted in the database with the details of the error. The composite instance is not saved. This means that the error is seen in the error handling console, it can even be handled if a fault policy is configured, but no information about the corresponding composite instance can be obtained. The composite instance id is set to Unavailable. We have seen that setting the composite level to Off in case of transient composites causes less data to be stored in the database, thereby increasing performance. The more instances of the composites created per day, the higher the benefit of this approach. We have also seen, however, that the composites should be well tested before setting this option because it can be quite cumbersome to track the origin of the error. This setting is therefore ideal for a production environment with heavy load, but suboptimal for a development environment with only a handful of instances but the need for extensive testing. This calls for a different setting in each environment. By using deployment plans, the problem of needing different audit level settings in different environments can be easily solved: the audit level of an intensively used transient composite can be set to Off in a production environment whereas the Development setting can be used in a development environment.